The KTM Tapah Road Railway Station (Stesen Keretapi Tapah Road) is located in the state of Perak in Malaysia and connected to the west coasts KTMB North - South Railway Line. Train services to Tapah Road Station are by the new high-speed Electric Train Services (ETS) as all the older, slower diesel Intercity Services have now been replaced by these newer, faster trains. Many of the new faster ETS services make a stop at Tapah Road, so you can easily and quickly travel by train to places like Kuala Lumpur (KL Sentral), Ipoh, Butterworth Penang, or all the way to the Malaysian / Thailand border station at Padang Besar. Batang Kali, Batu Gajah, Behrang, Kampar, Kepong Sentral, Kuala Kubu Bharu, Rawang, Slim River, Sungai Buloh, Sungkai, Tanjung Malim and the old Kuala Lumpur railway station. All the trains on the older ETS KL Sentral to Ipoh route stop here, but some of the newer longer distance Gold and Platinum ETS Services do not. In the past, Tapah Road was a popular place to take a train to if you wanted to travel from Kuala Lumpur to the Cameron Highlands (and from other towns to the south of KL) as the old, scenic, winding road up to the highlands started from near Tapah town. Now, with the newer and much wider road up to the highlands that starts from near Ipoh, people now use Ipoh Station as a transit point, so now at Tapah Rd, it can be quite hard to find any onward transport connections to the Cameron Highlands. If you want to travel from Tapah Road to Langkawi Island, you can use the ETS Trains to go to either Alor Setar Station or Arau Station and then transfer to the ferry ports by either taxi or bus. All of the remaining diesel Intercity services in Peninsular Malaysia that used to stop at Tapah Rd Station are now all cancelled and replaced by ETS Trains. The dual electrified track has been upgraded as far as Gemas, so currently if you want to travel further south, you have to change at Gemas and take a Shuttle service to JB Sentral in Johor Bahru. To continue on to Singapore by train, you now have to take one of the Shuttle Trains from JB to Woodlands Station. Train tickets can be purchased from the KTM Tapah Road Station or any other mainline KTMB railway station in advance. You can also book tickets online for the same price as you would pay at the station. 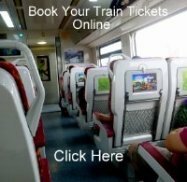 Advance booking for all ETS Intercity Trains is highly advisable as they tend to be full quite frequently and quickly sell out during busy holiday periods of the year.